What is the difference between Titanium Cookware and most of the non-stick pots and pans on the market today? Most non-stick surfaces are sprayed, glued or baked on. Therefore, they will easily chip, peel, crack, flake or blister. The Titanium Cookware cooking surface (Quantanium) is made from Titanium, one of the lightest yet hardest metals known to man, and a very small amount of ceramic. This relationship between ceramic and titanium is what makes it 10 times more’s nonstick than any other cookware on the market. The titanium surface is permanently embedded into the cookware so it will not chip, peel, crack, flake or blister…guaranteed for 30 years. Titanium Cookware has tri-riveted handles. Most other non-stick cookware has handles that are screwed on or spot-welded. Titanium Cookware is oven safe up to 500 degrees and all lids have reservoirs to prevent boil over and also have built in steam vents. What material is used on the non-stick cooking surface of Titanium Cookware? Titanium, one of the lightest, toughest metals known to man. NSF stand for National Sanitation Foundation; a non-profit organization that certifies cookware (and other products) for commercial use. Titanium Cookware is NSF certified. Please call 800-625-3777 for information to verify NSF certification. Any metal can scratch. If you scratch your Titanium Cookware (perhaps with a knife) the scratch will remain just a blemish, just like it would on stainless steel or cast-iron cookware. It will not peel, crack or flake off. The scratch will not affect the non-stick properties of the Cookware. Titanium Cookware will remain non-stick, guaranteed for 30 years. Should Titanium Cookware be “seasoned”, and if so, how do you do it? It is recommended that you season your cookware before using it for the first time. After that, the food you cook in it will re-season the pan over and over. Please read the Instructions that comes in each box of Titanium Cookware. I like to watch my food cook…why doesn’t Titanium Cookware have glass lids? All of our lids are vented reservoir lids. These lids Are specifically designed to allow venting during cooking, prevent messy spillovers, AND they don’t shatter if you drop them. What is a vented reservoir lid? Vented reservoir lids have built in steam vents that can be opened and closed with one finger. The reservoir built into each lid collects liquid that may otherwise boil over the side of the cookware onto the stovetop and onto the bottom of the pan (the most difficult part to clean). Since the boiled-over liquid collects in the reservoir lid, your cleanup is as easy as lifting the lid and pouring the liquid back into the pan. How do I clean something that may have burned in my Titanium Cookware? Simply wipe it out with a paper towel! Is Titanium Cookware dishwasher safe? Yes. You may want to remove the rubber handles though, as over time it may add a soapy discoloration/stain onto the rubber depending on what kind of detergent you use. The cooking surface will not be affected at all. I understand that Titanium Cookware has an aluminum plate on the bottom. Why aluminum? Is that safe? Aluminum is the preferred material used by Chefs in commercial kitchens because it heats up very quickly and evenly. Titanium itself is not a good conductor of heat, so the aluminum spreads the heat out evenly across the titanium surface. The cooking surface of cookware is COMPLETELY covered with Titanium, therefore the food will never come in contact with the aluminum or leach. For that reason, Titanium Cookware is completely safe. Is Titanium Cookware oven safe? Yes, up to 500 degrees farenheit. (Please remember to remove rubber handle grips before putting into the oven). Will Titanium Cookware work on an Induction Stove? No, Titanium Cookware will not work on an induction stovetop because the bottom is not magnetic. Titanium Cookware will however work equally well on electric, gas or propane stoves and convection ovens. Is TitanWare recommended for glass top stoves? Yes. Titanium Cookware is great for glass top stoves because the bottom is completely flat. A word of caution though, please refer to the users manual for your stove. Please be careful when placing and removing Titanium Cookware from your glass top stove as not to scratch it accidentally. Most manufacturers recommend against sliding any cookware on the glass surface. I understand that I do not have to use oil, butter, or spray when cooking with Titanium Cookware. I like to use butter. Will that affect the cookware in any way? Although you do not HAVE TO use oil, butter, etc . . . that does not mean you cannot use them. Using oil, butter, or spray will not affect your cookware at all. How should I clean the outside of Titanium Cookware? The bottom? The outside of titanium cookware has the same titanium surface as the inside, so simply wipe it off or wash it with a soapy sponge. The bottom is aluminum, and if stained will need to be cleaned with an aluminum cleaner. Can I buy just one pan, or do I have to buy the whole set? 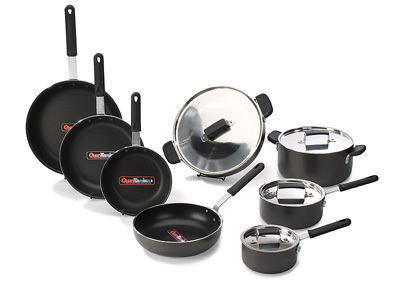 In order to bring you this amazing cookware at such a low price, we streamline our packing and shipping process. As a result, we are only able to offer the full set. What happens if I lose the grips or a lid? You can simply call the number found on your warranty card. We usually have grips and lids in stock. Are the sizes and types of pans on your website the only ones available? Yes, what you see on our website is the only available configuration. Can I purchase Titanium Cookware in any other color? No. Since Titanium Cookware was designed for commercial kitchens, aesthetics was not our main priority. Titanium Cookware is commercial-grade restaurant quality cookware, so it’s not the prettiest in the world, but it is the most non-stick in the world! What are some problems that Titanium Cookware will help eliminate? Eliminate replacing worn out pans for 30 years. Eliminate cooking oil, fat, butter, grease, lard or spray from your weekly shopping list. Cook healthy and reap the benefits; fewer doctor visits, reduce the need for cholesterol lowering drugs. Combat juvenile diabetes and childhood obesity. Use for stovetop cooking and baking as well. Eliminate extra bakeware. Cook using lower heat settings… save energy and money. Eliminate steel wool and soap pads from your weekly shopping list.